Speech Aid - Why was it made? The whole thing started because members of the former Lions Club of Buckingham took a local man to his monthly Laryngectomee Club meeting at Milton Keynes Hospital each month. For those people who are not sure, a laryngectomee is a person who, for some reason, usually due to cancer, has had their larynx, or voice box surgically removed. The larynx is located at the bottom of your throat, your throat being quite a handy junction for the windpipe, or trachea, and the oesophagus, which leads down to the stomach. During the operation the two pipes are separated. The windpipe is brought out through a hole, or stoma, at the front, and the mouth now only leads to the stomach, through the oesophagus. The voice is something we take for granted. Air from the lungs passes over the vocal chords which start to vibrate, making a sound which we form into speech, singing or whatever with the mouth, nasal cavity, lips & tongue. The more air from the lungs, the louder the sound. With practice, this can produce quite an intelligible form of speech. The only drawback is the amount of air that is available from the oesophagus is limited therefore the volume is low, sometimes down to a whisper. And this is where LIONS came in! One of the other members of the laryngectomee (Larry) club, Bonnie O’Brian had bought a small amplifier and tie clip microphone from Tandy’s to use when he was at his ex Serviceman’s club to make himself heard over the usual hub-bub of noise. He couldn’t use the mike clipped to his tie, or lapel as it picked up the wheezing sound he made breathing through his stoma. Instead, he taped the mike to a stick to hold to his lips. The only problem was, he enjoyed a game of cards and wanted two free hands to play. He asked the Buckingham Lions Club for help. 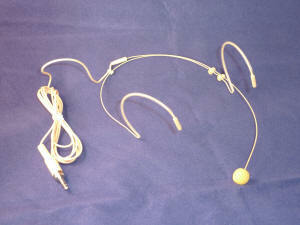 They thought over his problem and with the aid of some scraps of plastic tube and wire, mounted the mike so that it would clip to his glasses allowing the mike to be placed near his lips. That only left the switching on and off of the amplifier. That was solved by making up a simple remote switch on the end of a lead and modifying the amplifiers switching circuit. It worked for Bonnie and soon other club members wanted one, then members of a club in Northampton heard about it, and they wanted some, and the project was born, literally, a garage industry. The Buckingham Lions Club initially funded the purchase of the bits and pieces and they sold them on to recover the costs. At that time, Past District Governor (PDG) David Green was the Region Chairman and, during one of his visits to the club, heard about the project and thought that it could become a 'District' project. So in January 1989 the Club wheeled Bonnie and his amplifier in front of the Cabinet for a demonstration, they thought it would be a good idea as well. A working committee was formed and a few months later, with the aid of donations from other Clubs in the 105A District, The Lions Laryngectomy Project was started. Initially, the Tandy amplifier was still used but modified slightly. 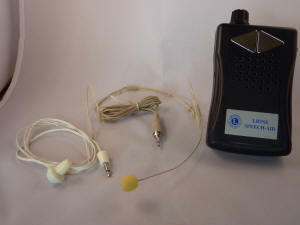 The microphone came with its own little battery and pre-amplifier that proved to be a bit fiddly, so the main amplifier was modified to incorporate the circuitry required for the mike. The project expanded when, over the years, Speech and Language Therapists’ in other parts of the country heard about the unit and started to try it out with other client as well as Larry's. It was found useful to MS, Motor Neuron Disease & Parkinson’s Disease sufferers as well as victims of strokes and any other affliction which reduced the volume of the voice during normal speech. The Amplifier changed shape when Tandy imported from a different source. The projects name was changed to Speech Aid when people other than laryngectomees started to take an interest and buy them. People who use them now include stroke victims, people with Parkinson’s disease, Motor Neurone disease, Multiple Sclerosis and in fact anything that can rob a person of volume of speech. When supplies of the amplifiers threatened to dry up, it was decided to produced their own model for the first time and that proved to be very popular with users. The unit has developed with improvements such as to provide a touch contact on/off switch, an indicator light and an isolation switch for transportation as well as a lightweight speaker which has cut down the weight of the unit. We also now buy in a lightweight head microphone which has brought the looks of the unit in line with other modern communications devices. by Lion David Lloyd for Lions Speech Aid. The Project is now called “Lions Speech Aid “ and provides a useful, low cost speech amplifier at the economy end of the market . The device is intentionally low tech to keep the price down and is targeted at cash strapped NHS Trust departments to provide a low cost starter device for their clients. Similar commercial devices on the market start with a cost of greater than £300 which many clients find prohibitive. Average sales over the past few years are 20 to 40 per annum. While this sounds low, this is a very small and a highly competitive market. Our units are hand built in a UK based “garage industry” . Lions Speech Aid was never intended as a high volume sales initiative, more as a slow feed to a needy, narrow focused market to help those most in need and less able to fund their needs, and as such it has and continues to succeed. Speech Aid - What is it? The Speech Aid is not unique; there are several of them on the market, at a price. When it was first started, other amplifiers were large and bulky or very expensive, over £250, and all used small hand-held microphones. Now there are other aids with boom microphones, but they are still very expensive. We have managed to keep our price down to £90 plus postage. Our Aid comes with a microphone, earphone and charging unit. An 8.4V 200 mAh Ni-MH battery is fitted and its output is approx 325 m/w. It measures 118x72x26mm and weights approx 185 gms (battery included) . It is fitted with a clip to allow it to be hooked onto a pocket, belt or neck-cord etc. We are constantly trying to improve the Aid to make it more convenient for the user. Sales are unpredictable, after all, it is a rather specialist field and a relatively small market. Customers can be private individuals, Hospital NHS Trusts, Speech & Language Therapy units and organisations such as the Motor Neurone Disease Association and the Parkinson’s Disease Association. Lions Speech Aid is non-profit making; all proceeds are banked with the 105A District Treasurer and go towards the production of the next batch and the supply of leaflets, stationery etc. NHS Trust Orders should be made through the Trusts procurement system.